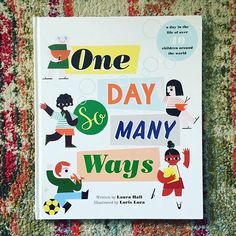 Sausage, egg, and cheddar bagels for everyone! 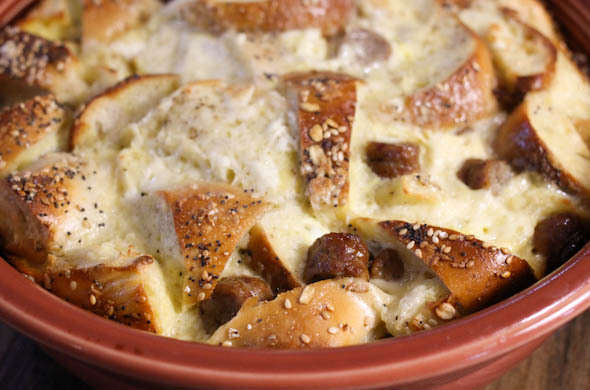 I made this savory bread pudding with my favorite bfast sandwich fillings for an Easter brunch. It was SO good and perfect for a group since I prepped it the night before and just popped it into the oven. It puffed up and was nicely soft. The leftovers were delicious too! Smitten Kitchen made this with cream cheese, onion, capers, and smoked salmon. I went with my preferred sausage/egg/cheddar combo. 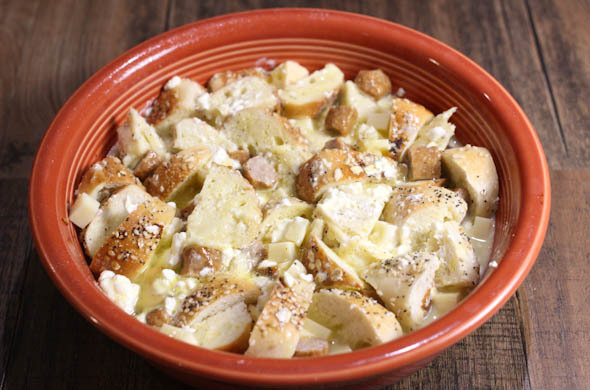 Chop the bagels into bite size pieces. Chop the cheese into 1/4 inch cubes. Pan fry the sausage until cooked through. Then chop into bite sized pieces. Spray a baking pan with non-stick spray. 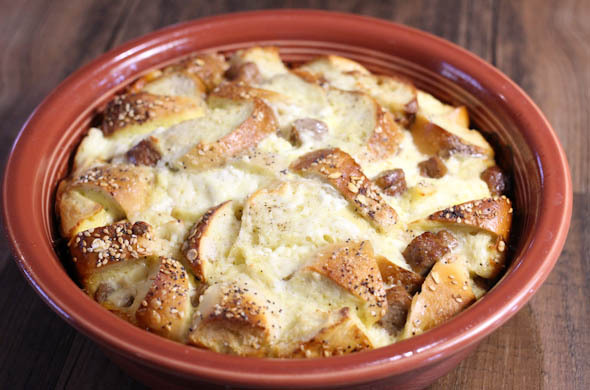 Add in half the bagel pieces, then top with half the sausage and cheddar pieces. 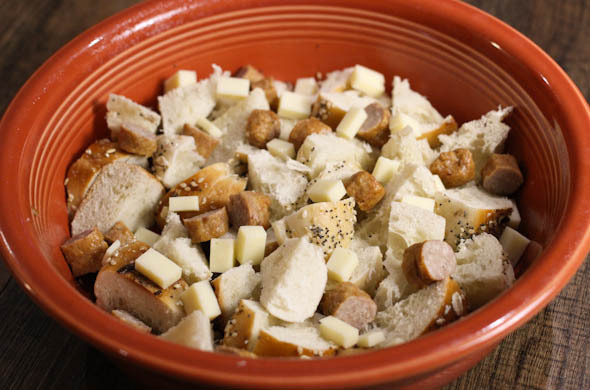 Place the remaining bagel pieces and the remaining sausage and cheese pieces on top. Turn the very top bagel pieces over so the outside of the bagel is facing out. Sprinkle with salt & pepper. Whisk together the egg whites, eggs, milk, and cream cheese. 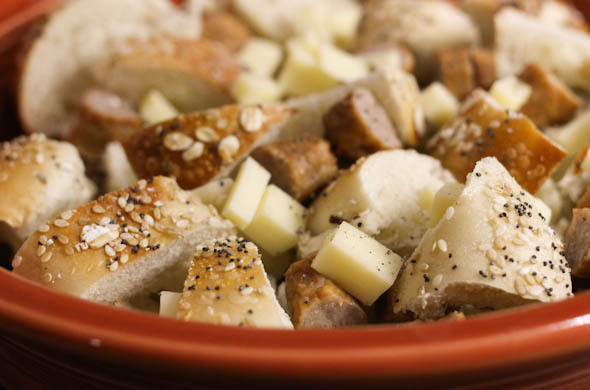 Pour over the bagel, sausage, and cheese pieces. Cover and refrigerate over night, or until ready to bake. Bake at 400-degrees for about 45 minutes. Poke a knife in to see that the egg is fully cooked. It shouldn’t be runny in the middle. It puffs up and is so great! The chewy bagels are soft but such a great texture. I loved the everything bagel-ness with the sharp cheddar, the sausage, and the eggs. The mostly egg whites made it a touch lighter! I can’t stopppp! 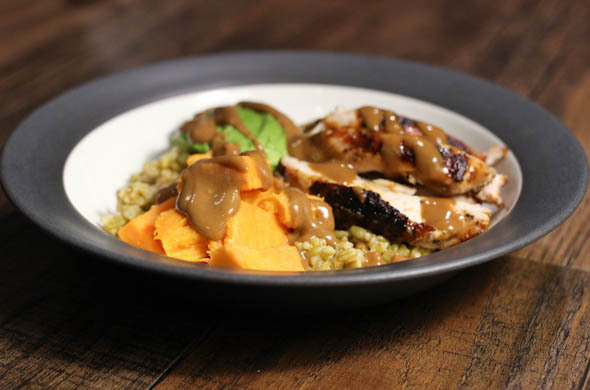 I love these bowls with a few elements tied together with a quick drizzle of sauce for a balanced, speedy, and fun dinner. I appreciate these qualities most during my busy time of year at work and with meals the toddler can eat before/after us. Next time this one could use more texture, but it was tasty and added some good variety to the week. Marinate the chicken overnight, or for 3+ hours in Italian dressing & some soy or teriyaki sauce. Then heat up the grill. Cook the grain: I used cracked wheat + 1 1/2 cups water to a boil, then covers and cooks over low for 20-ish minutes. Micro the sweet potato(es) for about 5 minutes. Flip them once and poke holes with a fork. Grill the chicken until cooked through. 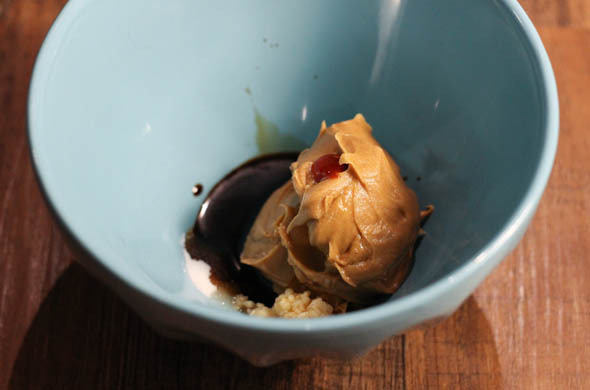 Add the peanut butter, soy sauce, garlic, ginger, sugar, lime juice, and hot sauce to a bowl. Whisk together, and add in a splash of water. Whisk again, and add more water if needed. (I started with about a tablespoon and added another teaspoon). It should be drippy enough to drizzle over the top of your bowls. Once the chicken has sat for a few minutes, slice into strips. Once the sweet potatoes are cool enough to handle, slice in half, then scoop from the skin with a spoon and slice into bite-sized pieces. 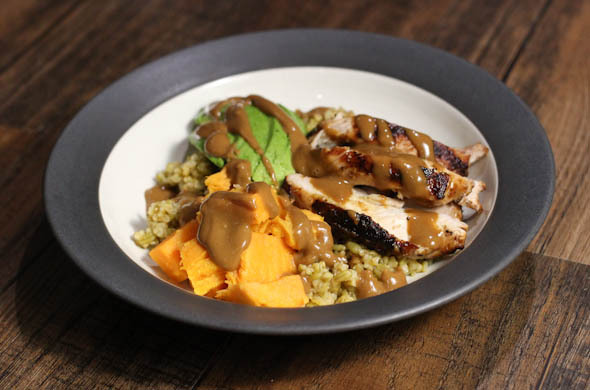 Assemble the bowls with 1/4 of the grain in the base of each bowl, then add chicken, sweet potato, and avocado. Drizzle the peanut sauce on top. 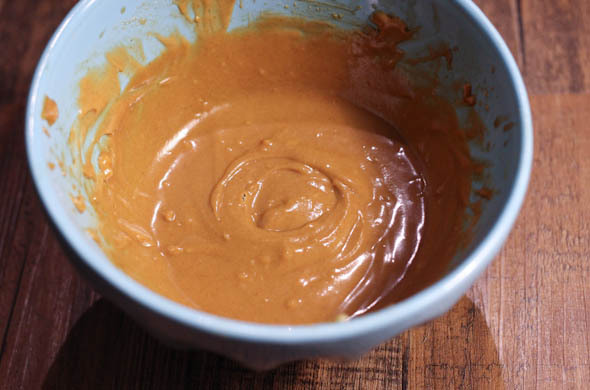 I loved the peanut sauce being creamy from the pb and salty from the soy sauce and a little wake up from the ginger and sriracha sauce. I cooked the sweet potato the night before so these were even speedier than they seemed! 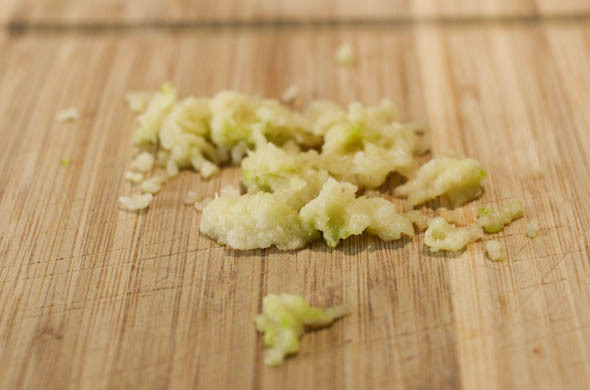 I thought I had edamame int he freezer – that would be a better texture to each bite than the soft avocado with soft sweet potato. What’s my next bowl? I need a new theme! 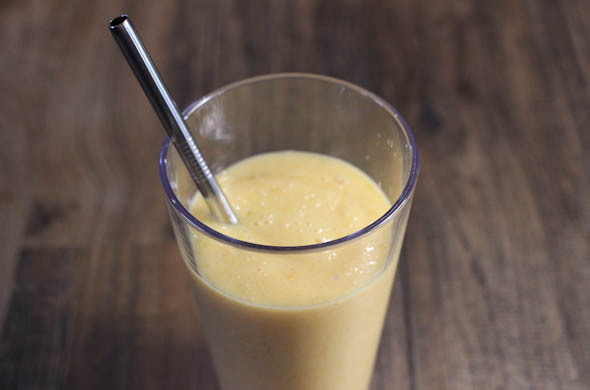 The secret ingredient that makes this taste wayyy better than just slushy orange juice is…….Frozen mango! This was so fresh, light, and perfect for the morning. 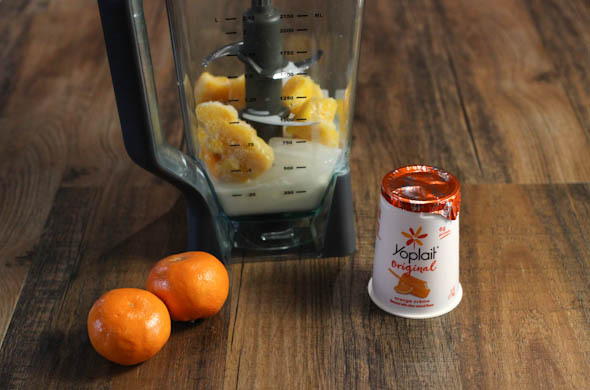 Then add in the yogurt and clementines/orange. Blend and enjoy! Add another splash of milk if needed. 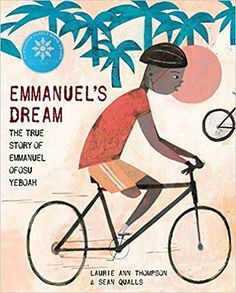 I looooved this! It wasn’t as tart as it would have been with strictly oranges. 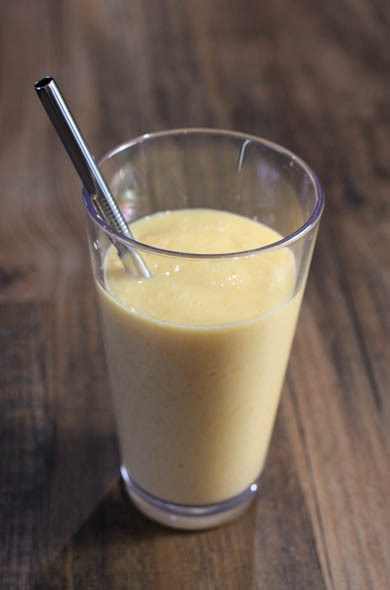 The mango and vanilla are both the touches this smoothie needs to go from being acidic to a gentle orange flavor. I gave the little one some but he wasn’t into it – I think it was too cold. 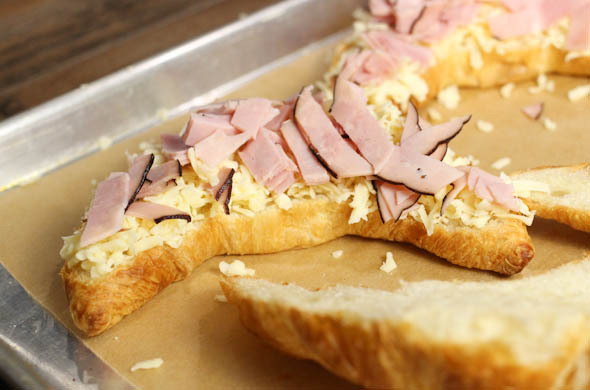 This is THE sandwich which will make you believe in sandwiches for dinner. This is not your lunch box sandwich. The French know what they’re doing with this one. 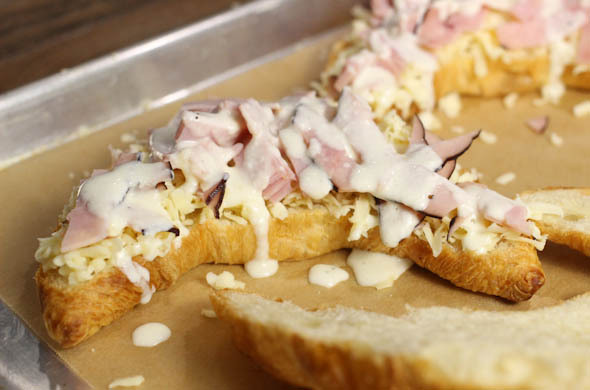 The Croque monsieur is grilled ham and cheese with a béchamel and some cheese melted on top. This knife-and-fork sandwich is lovely for dinner and I twisted it up with a croissant for the bread. 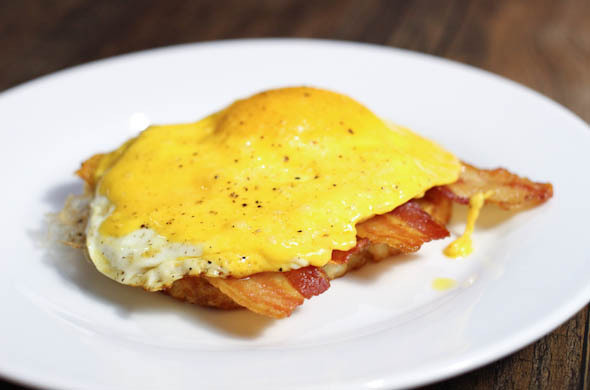 If you add an egg it becomes a croque madame…though, adding an egg didn’t seem like it’d be stable on the croissant. 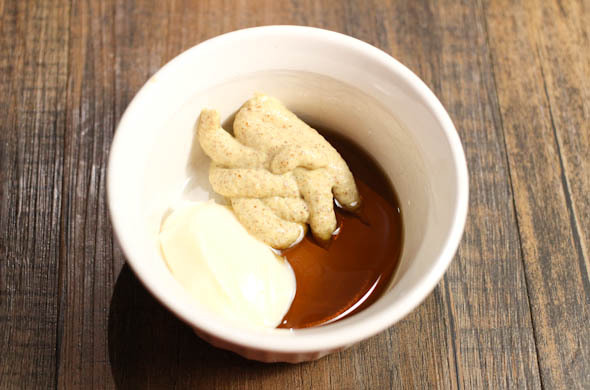 In a small pot, bring the milk and cream cheese to a simmer to melt. Add salt and pepper and cook for 5-8 minutes then reduce to low heat to thicken. Slice the croissants and toast on a baking sheet for 5 minutes to gently toast. 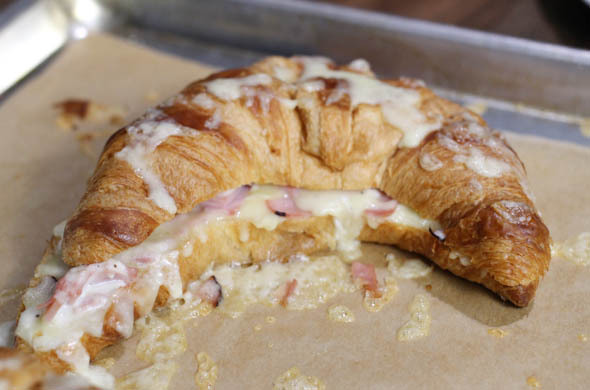 Then top the bottom croissant half with most of the cheese, the ham, and a sprinkle of pepper. Spoon some of the cream sauce on top. Add another sprinkle of cheese and put the top croissant on and pop back into the oven just to melt the cheese. Spoon a drizzle of sauce over the top. Serve (with a fork & knife) and enjoy! 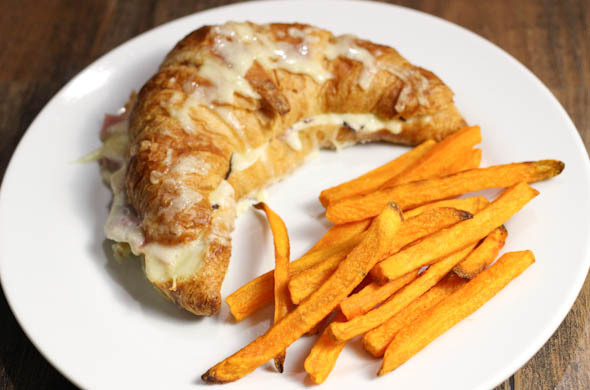 Ohh Monsieur Croque, you’re delightful on a croissant. Using good cheese is important for this guy. I shredded the cheese for prime melting capability and chopped the ham for ease of distributing onto an arch-shaped croissant. The sauce is so much faster and easier than a roux. I liked the cheesy-hint from the cream cheese. A new pizza format!! I saw somebody make one with a lot of garlic oil on the Food Network and that’s just what I did! It becomes super crispy like pan pizza. I loved it and will use more dough to make it again. The pan gets warm and starts cooking the bottom of the dough and then goes into the oven to cook from the top. The one-two punch! 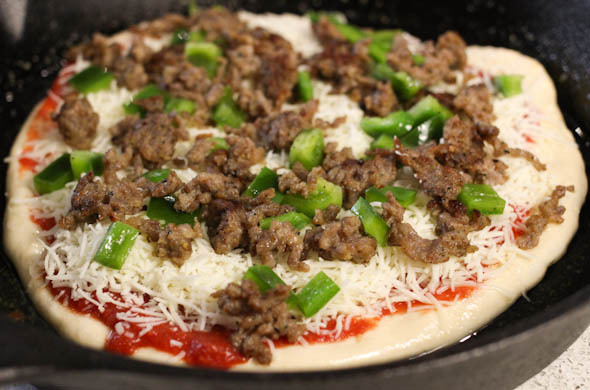 In a medium skillet, remove the sausage from the casting and cook through – about 5-7 minutes breaking apart with a spoon. 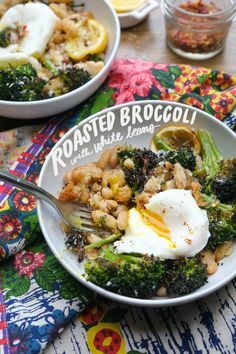 In a large cast iron skillet, warm to medium-low heat and add in the oil and the garlic grated or very finely chopped. Cook for about 5-8 minutes being careful not to brown the garlic too much. Drain the sausage onto paper towels to remove the oil. Then add in the pepper to cook and soften for just a few minutes, then remove. Stretch out the dough, or roll it to the size of the pan (my pan was very large and I could have used the whole dough ball – the crust could go along the edge). Lay it into the hot pan over medium heat. 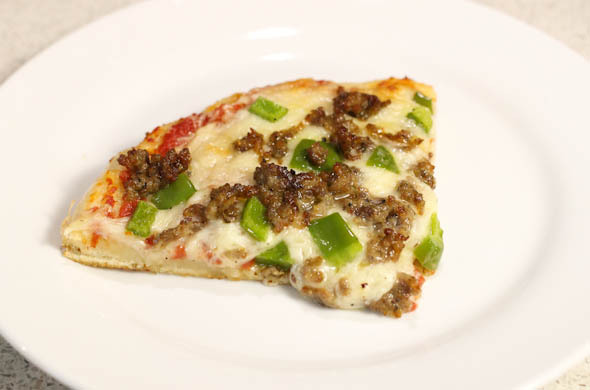 Spoon the sauce onto the crust, then top with cheese, cooked sausage, and peppers – cooking for about 5 minutes. Put into the oven for 20 minutes, or until the edges brown & the bottom crisps. Lift from the pan to remove while keeping any remaining oil in the pan and not onto the pizza. Let sit for about 2 minutes, then slice & enjoy! I loved allllll the crispy and chewy crust! It had a nicely sweet garlic flavor since it gets to gently cook while the other toppings are prepped. I read some blog posts of skillet pizza who touted the little amount of oil. I went for it. Big time. 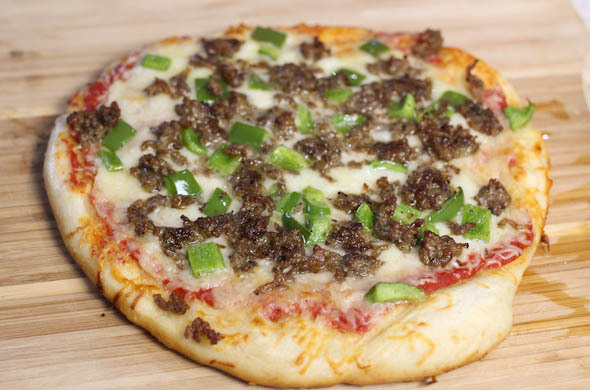 This was crunchy and packed with flavor without being grossly greasy…just greasy enough. I’ll make this pizza again. 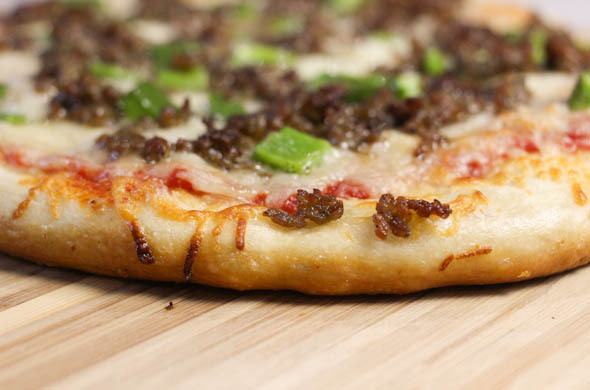 It has great texture and was a perfect alternative from super thin crust on the pizza stone. 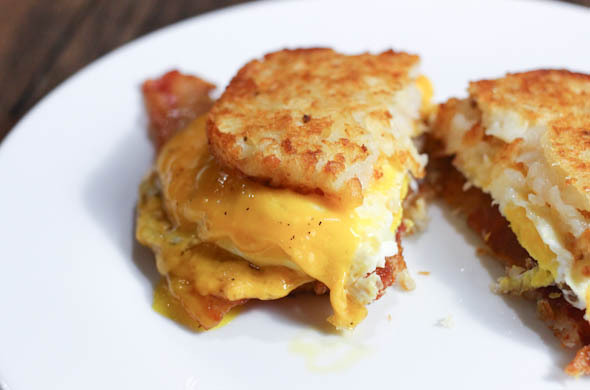 Breakfast sandwiches are one of my fav foods so I decided to give it a twist with hashbrowns and a sweet sauce, crisp bacon, and sharp cheddar. Yesssss. Also. I baked the hashbrowns in the bacon drippings. Necessary. Preheat the oven to 375-degrees. Set up a baking sheet (one that has edges) topped with a cooling rack. Spray with non-stick spray and lay the bacon onto the cooling rack. Bake for 7-10 minutes, until crisp. When the bacon is crisp, remove and let drain on paper towel. Careful (it is hot!) remove the cooling rack, and pop the hash brown patties onto the baking sheet and bake according to the package – flipping partway through. Mine took about 18 minutes to get very crispy. 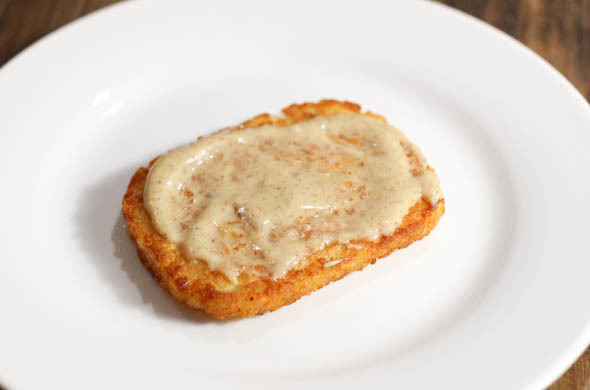 While the hash browns are cooking, mix together the mustard, mayo, and maple syrup. 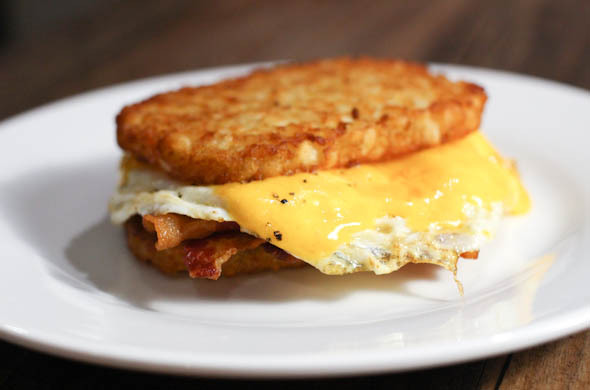 When the hash browns are crispy on both sides, pan fry the eggs. Flip and add the sliced cheese on top. 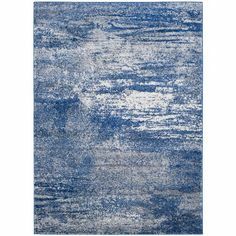 (Some sauteed spinach or greens would be nice here too – mine had gone too far so I had to skip it). While the eggs cook, smear some maple-dijon sauce onto the bottom hash brown (then greens if you’re using). Top with bacon then with the egg & cheese. Then top with the top hash brown. Yum. I loved these. They were a tiny bit tricky to pick up…more of a fork-and-knife dish. I really wanted some garlicy wilted greens inside here, but my greens were slimy. No thank you. This little place near work makes a breakfast sandwich with this maple-y mustard sauce. It is just the surprise to keep this alive. I mellowed mine out with 1 part mayo because for some reason this dijon is knock-yo-socks off tangy. 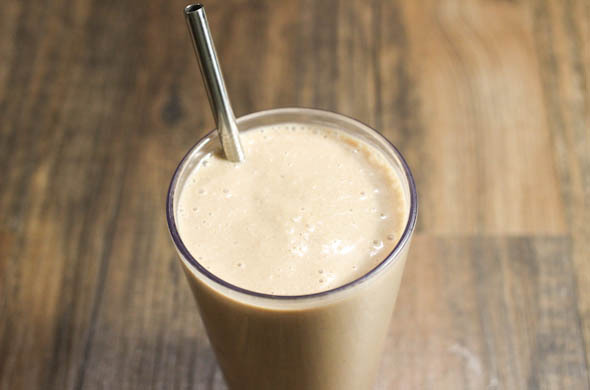 This smoothie was for breakfast, but definitely suggested dessert. The coconut was light and the caramel felt like a treat. Whenever bananas are on their way out I chop them into chunks and freeze them. They make smoothies so creamy. 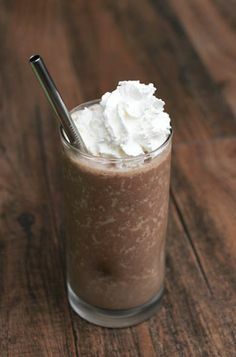 I kept it as simple as possible for a breakfast, but would also love this with a touch of chocolate or coffee. 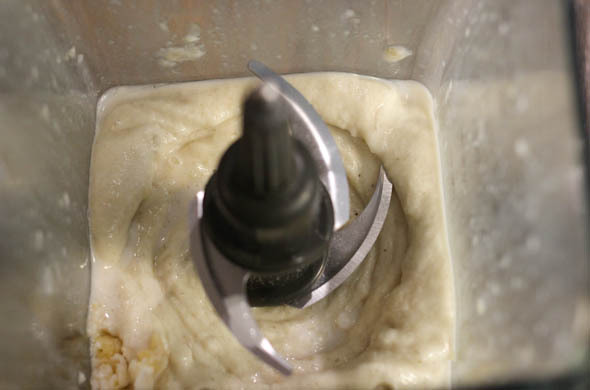 In a blender, add in the banana, coconut almond milk, ice, and yogurt. Add in the caramel sauce. Blend again. Pour in another drizzle of milk, if needed. 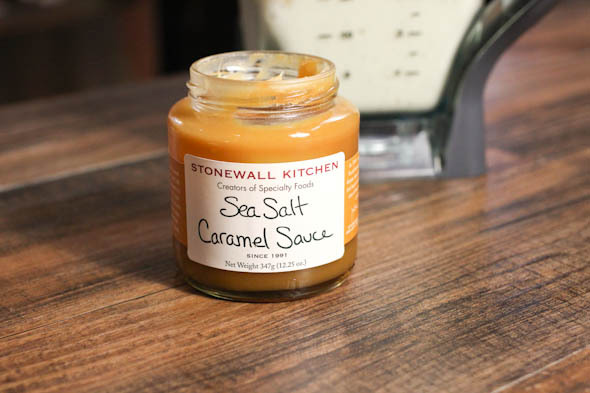 Pour into a cup, and drizzle with caramel. Enjoy! SO good! It was sweet, but so delicious. 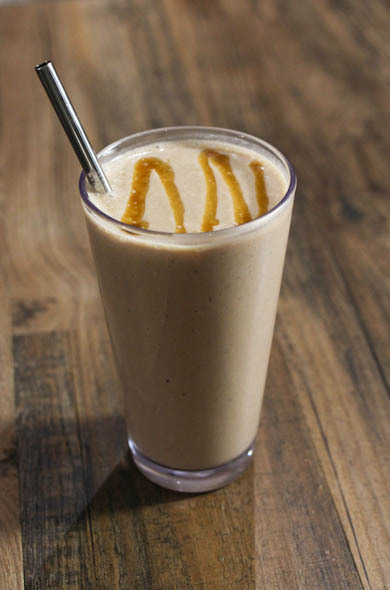 The banana, the yogurt and the almond milk made it filling while the caramel made it delightfully special. And if we’re being real, sometimes that’s exactly what a Tuesday needs.